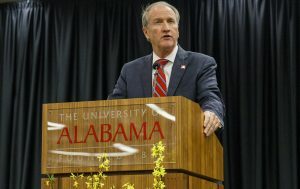 University of Alabama President Stuart R. Bell provided his spring address to UA’s faculty and staff during the 2019 Spring Campus Assembly on Tuesday. UA President Stuart R. Bell addresses UA faculty and staff during Spring Campus Assembly. Bell commended UA’s faculty and staff for continuing to elevate UA’s stature over the past year. He recognized 26 current faculty members who have received NSF CAREER Awards, the nation’s most prestigious honor for top-performing young scientists; the Hugh F. Culverhouse Jr. School of Law being ranked 25th among the nation’s top law schools, 8th among public law schools; and the Capstone College of Nursing for its designation as one of 16 National League for Nursing Centers for Excellence. He also noted UA is ranked 10th nationally for internship placements and its online business master’s program, with both of those programs ranking first in the Southeastern Conference. UA faculty were also honored for their research contributions throughout the academic year. During the fall semester, more than 80 faculty members received their first externally funded research award at UA. In December, the University was named among the top doctoral research universities in the nation by the Carnegie Commission for the first time in history. Bell also encouraged faculty and staff to be proactive in giving back to the Capstone through the We Are UA giving campaign, which concludes April 11, and participating in planning the next universitywide campaign. “Unquestionably, The University of Alabama is a special place – and you are its champions,” said Bell. Several new national champions were recognized during the ceremony, including the men’s and women’s adapted athletics basketball teams, who brought home national championships in March, the national moot court champions from UA’s Hugh F. Culverhouse Jr. School of Law, and senior Alana Doyle, who was recently named PRWeek Student of the Year. She is the second UA student in a row to claim that honor. In addition to his remarks, Bell presented two prestigious awards during the assembly. The E. Roger Sayers Distinguished Service Award was presented to Laura Beth Brown, social worker at the University Medical Center’s Office of Case Management and Social Services. Dane Cameron, director of access services at Brewer-Porch Children’s Center, received the Dr. Minnie C. Miles Endowed Excellence Award.